Starbucks sales of $6 billion in its fiscal second quarter were up 14 percent, but profit margin suffered due to restructuring, business changes related to its ownership in East China and employee investments. Starbucks has so far seen no significant financial impact from the uproar surrounding the arrest two weeks ago of two black men in a Philadelphia store, chief executive Kevin Johnson said Thursday. However, Starbucks has yet to quantify the cost of closing its 8,000-plus company owned stores in the U.S. for the afternoon of May 29 to provide its employees with racial-bias training, the company said as it announced quarterly earnings. The Seattle-based coffee giant reported sales growth of 14 percent to more than $6 billion for its fiscal second quarter, but its profit margins shrank amid business changes in China, costs related to streamlining its operations and investments in its workforce. Johnson said the afternoon training next month is a “small piece of a set of ongoing actions” the company is taking to address its policies and practices after the incident in Philadelphia, in which the store manager called police to remove the two men, who had not made a purchase while waiting to meet an associate. Starbucks’ profits in the quarter-ended April 1 were $660.1 million, or 47 cents per share, up 4 percent from the year-earlier period, but short of the Wall Street consensus estimate of 53 cents. Starbucks stock, which was up 2.9 percent Thursday, gave back 1.9 percent in extended trading after it reported earnings, finishing at $58.25. Comparable sales across the company’s global operations increased 2 percent in the quarter, with comparable sales in its fast-growing China business up 4 percent. 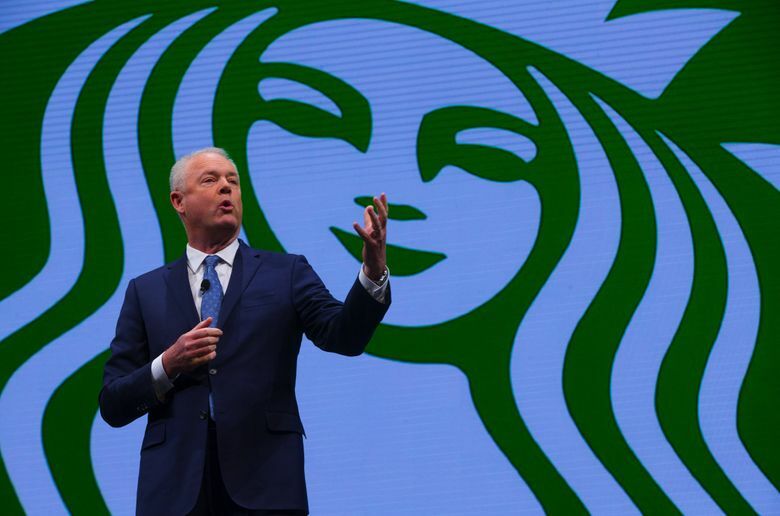 Financial analysts pressed Starbucks executives during a conference call about efforts to further improve same-store sales and expand profitability, which shrunk during the quarter. Starbucks’ operating margin decreased to 15.6 percent in the quarter, which chief financial officer Scott Maw said was in line with the company’s forecasts. Starbucks pinned the decline on restructuring and impairment costs; a changing lineup of food sales, particularly in its Americas business segment; increased investments in employees; and its purchase of the outstanding interest in its East China business from partners in a joint venture there. Starbucks’ margin in the same quarter last year was 18.8 percent. Maw said the company has “a clear set of actions under way to improve comp growth and profitability as we move through the year.” He said comparable sales are gaining momentum and should improve to 3 percent during the second half of the fiscal year. Those actions include a new scheduling system – rolled out in February – designed to allow individual store managers to customize work schedules based on sales patterns throughout the day in their stores. It replaces what chief operating officer Rosalind Brewer described as a “one-size-fits-all” approach and is already resulting in labor efficiencies that should contribute to operating margins. Starbucks is also focusing its promotional efforts on personalized personalized offers made to customers through digital channels. The company is trying to gather as many customer emails as it can through signups for in-store wireless Internet access and mobile ordering and payment technology. It aims to hook tens of millions of occasional customers on its products through the kinds of marketing it uses to target its most loyal customers. This group, members of the Starbucks Rewards program, grew by 12 percent in the last year to nearly 15 million. As it builds a base of customers with which it has a digital relationship, Starbucks is de-emphasizing the strategy of limited-time offers and happy hours it has used over the last several years to entice occasional customers into its stores, Brewer said. A third area of focus is sales during the afternoon, which Starbucks aims to goose with new cold beverages, an improved atmosphere thanks to better staffing levels and a continued emphasis on food sales – though this business line brings with it higher costs and more waste. In the U.S. alone, wasted products cost Starbucks $500 million a year, an amount Maw said the company aims to cut by at least 15 percent over the next 18 months. Starbucks’ Siren Retail strategy of opening high-end Roastery and Reserve stores, an initiative led by executive chairman Howard Schultz, is not expected to show a profit in the near term. “It will be beyond 2019 before that segment breaks even,” Maw said.